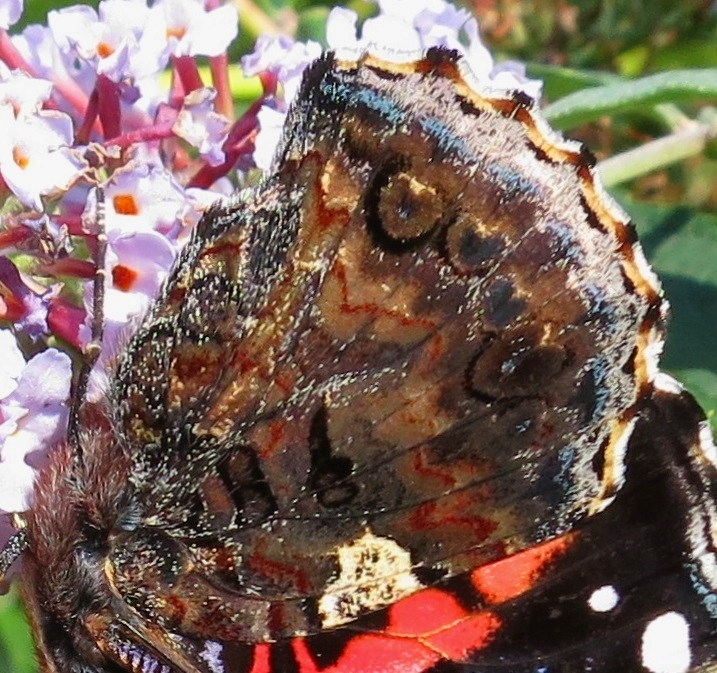 This is a Red Admiral butterfly (Vanessa atalanta) on a buddleia flower. It's a familiar sight in late summer - especially along parts of the South Coast of England where Red Admirals gather before migrating to Africa in advance of the winter. It seems an impossible task for such fragile beings. But there you are, many facts seem impossible but are true. I'm getting into a tangle! 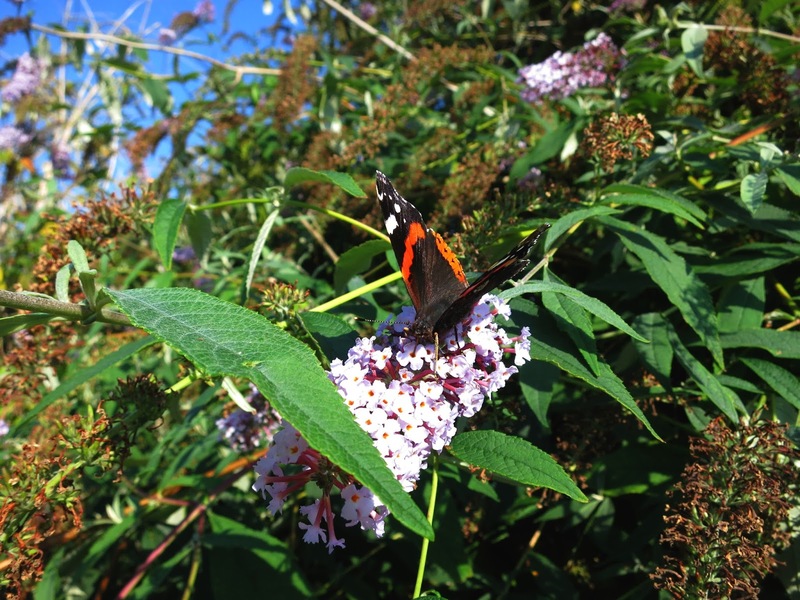 I've never counted Red Admirals on a Buddleia. For one thing, I hadn't thought of it till just now - and now is too late, mostly they are gone. For another they don't stay still. They aren't fluttering around all over the place, they sit a while, then move to another flower; it's a slow but shifting scene. 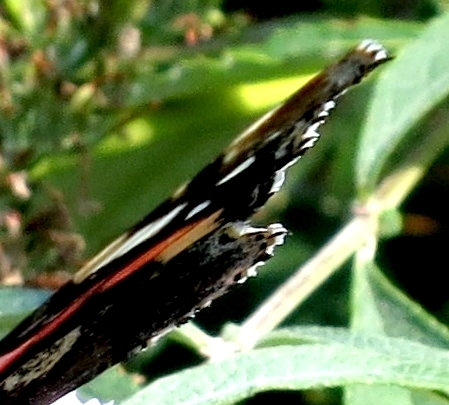 Red Admirals are dramatic. Red and black showing clearly on the bushes. When I remember them I nearly always think they are bigger than they really are (wing tip to wing tip) and photographing them is a bit awkward. They move. 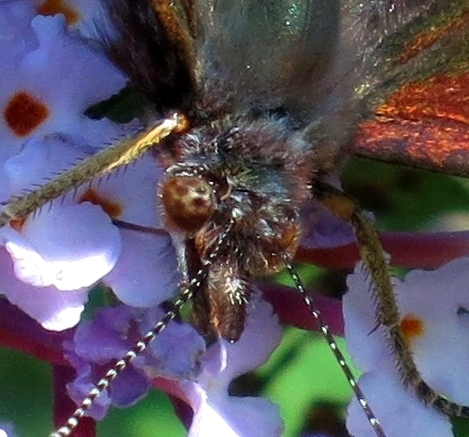 Buddleias aren't tall trees but one can rarely get close to a butterfly sitting on one. The most important thing, I've found, is not to let a shadow fall across them. They find this more alarming than being looked at close to - but close to is difficult when there's a ditch in the way. So . . . it's easy to be aware of only three things; that are lots of them, that they are brightly coloured and they like buddleia. Which is why I decided to look at them in detail. And for the reasons listed the detail won't be high quality (especially if you're viewing on a large screem). I like my camera but it's stretching it a bit to do well when one zooms in and crops. Never mind. You'll get the gist. I think you'll be impressed - not by the pictures themselves but what they point to. 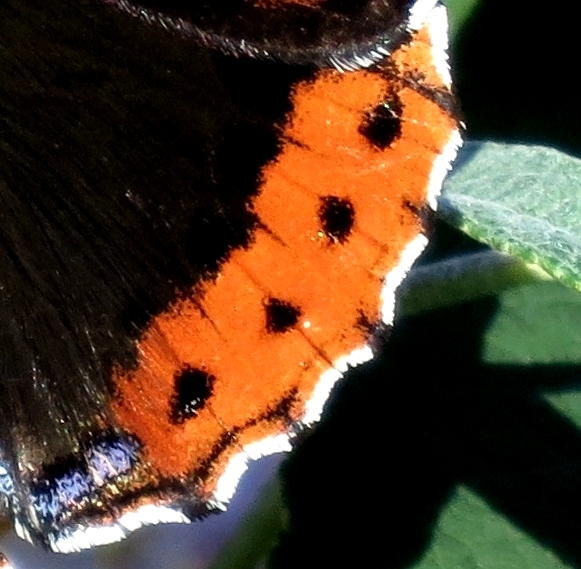 A butterfly is more than red and black with bold bits of white. Sideways look at a wing. The edge of a back wing. Proboscis. 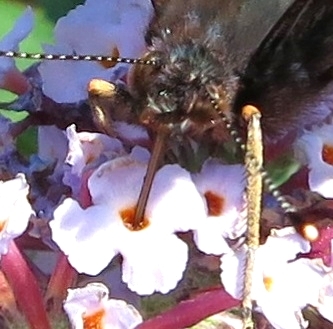 A Red Admiral drinking nectar. Learn About Butterflies: The Complete Guide to the World of Butterflies and Moths. 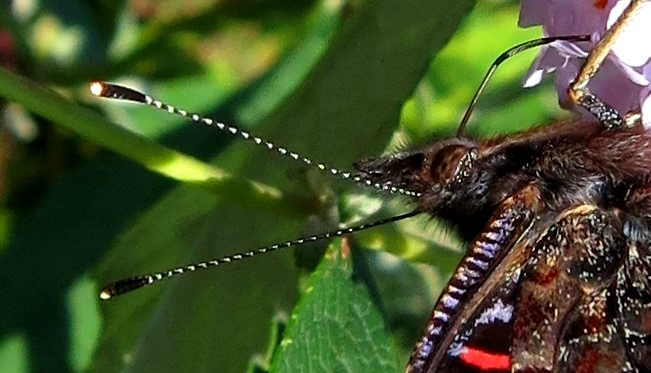 And in particular because it's relevant to this post, the section on Butterfly Anatomy. And REMEMBER - there will be a link box for posts about urban wild plants this coming Sunday (September 21st 2014). For more information, there's a 'Street Plant Bloggers' page. If you are not participating this time but intend to - maybe in April - let me know in the comments or email me at looseandleafy@googlemail.com and I'll add you to the list as an occasional street plant blogger. 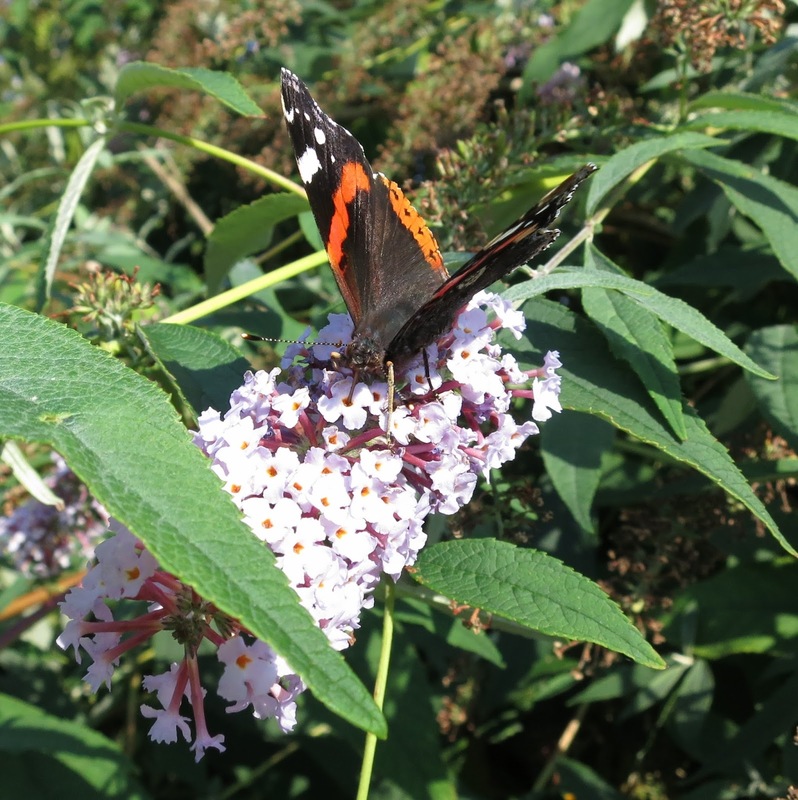 I have strong childhood memories of the "butterfly bush" covered with red admirals and other butterflies. I have seen quite a few of these insects about this year.